Charlie Bears Jago Discounts Apply ! From The 2017 Plush Collection, Designed by Isabelle Lee . Charlie as you know adores creating bear friendships and often creates two little characters that have most certainly been designed to go together but, it�s not just bears she does this with it can be sometimes other animals too! Meet Ginny and Jago our new panda pairing both have been created is soft silky plush materials. They have some of Charlie�s favourite design features too like their flat paw pads so they can stand. 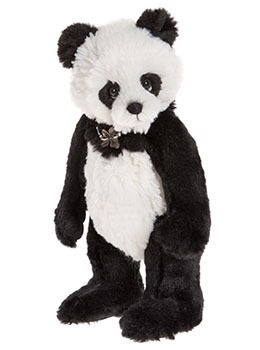 Small eye whites which create the Charlie Bears signature �who me?� and sculptured paw pads with our tickly toe detail have been added along with teardrop markings to show they are pandas and the tiniest of hand stitched noses. Simple accessories have been created in the form of small thread collar necklaces with flower pendants. So you know who is who in this gorgeous pairing Jago has a traditional black and white coat and Ginny has a grey and white coat.